The clouds are still high and above summit level, they were forced up to this height by sun-driven convection during the day. They'll disappear after sunset as the mountain stops being heated directly by the sun although on the odd occasion they'll hang around and cause us problems for a few hours. Sometimes, especially during the winter, they'll drift over us and ice everything up from the dome to our vehicles and then perhaps the road itself. We tend to evacuate before the road becomes dangerously iced because we don't want to be trapped at the summit, it's not the most pleasant place to spend a couple of days as a few people have found out in the past. During the summer, however, the ice will hardly ever be bad enough to force an evacuation. In the south towards Mauna Loa the clouds look even more threatening. I woke up to one flustered bird this morning. After he spent yesterday morning and evening trying to evict me from my house Norbett was really pissed off with me this morning. Yesterday he spent his time flying around the house constantly chirping and playing hide-and-seek but this morning he was clearly upset. Maybe my snoring disturbed him overnight or something, but he felt it was time to make himself look big and hopefully scare me out of the house. He was even on the top lanai looking in through the screen doors. Jeeze, how about a bit of privacy? Sorry, Norbett, I left because I had to go to work, so even if you think puffing yourself up into a big red ball scared me this morning, you'll be disappointed when I return. It was around 5:30am I think; a very irritating noise that sounded like a small smoke alarm in "low battery mode" and awfully persistent. These days I've learned to sleep with the noise made by the coqui frogs although if one gets close to the house the noise can be somewhat overwhelming. I usually take care of that situation quickly but early this morning there was something different that woke me up. So it's out on the lower lanai with an early morning cup of tea and suddenly the noise is moving around, it's almost circling the house. 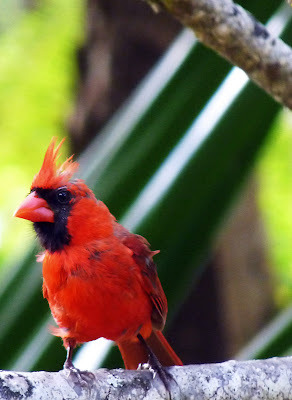 Some animal is making a hell of a noise and then I spot it - a Northern Cardinal. I see them quite often around here and they visit the garden from time to time, but I think this is the first one that has decided to make my house its home. I've found that they are also extremely difficult to photograph: they're very active, quite jittery and love to hide behind leaves and tree branches while they keep an eye on you. 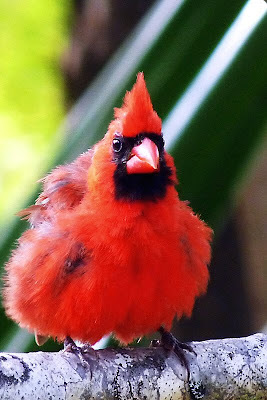 Cardinals are not native to Hawai`i but were introduced in the 1930s. 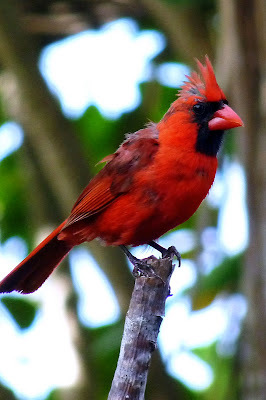 From what little research I've done there are three species of cardinals in Hawai`i and the Northern Cardinal is the one that is found on the Big Island and they seem to like it here. This one was especially insistent that I ought to leave his territory and it's probably because he's found a mate, although I only managed a fleeting glimpse of her this morning. When I returned from work this evening he was back in smoke alarm mode within a few minutes. 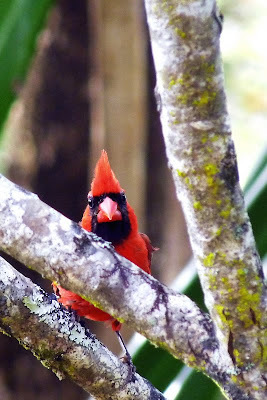 On the odd occasion he even perched on the lanai a few yards from me and made one hell of a fuss. I guess we'll get used to each other over time. I've been trying to teach myself so much about photography during the last few months that sometimes it all falls apart. It's encouraging to see expert teachers and photographers, such as Scott Kelby, describe their own failings when taking pictures and that even the best get it wrong from time to time. His recent books, "The Digital Photography Book" (volumes 1, 2 and 3) are without doubt the best photography books out there for students, but he also describes the many pitfalls he and every other photographer experiences - and there are many. I loved the scene I took above but got it all wrong. It was taken a couple of weeks ago and only just got around to looking at the photos. Part of the blame can go to the camera, it's not a DSLR and I might have got away with one or two things if it was, but still, a noisy image and not enough care to make sure I had all the settings correct at the time ruined it. It's a shame, but there are still some parts of the picture I really like, so here it is for you to see as well! I don't have the software the pros have and suspect I could have rescued it a little more if I did, but money right now is tight and is much better spent on fixing the latest disaster in my house than buying software! 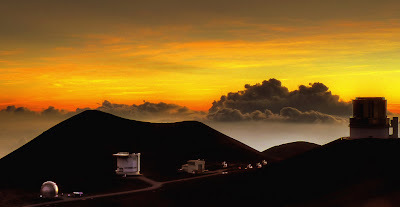 Well after sunset on Mauna Kea you can look out to the west and still see amazing colours in the sky and more often than not a dazzling display from very distant cirrus clouds. Sometimes these clouds aren't even on the IR satellite images although they always seem to be present on the western horizon. My guess is that they are a few hundred miles away and one day I'll sit down and try to calculate how far away they really are. It really ought to be a relatively simple geometry and trigonometry problem although I'll have to throw in the time of sunset as well and probably the odd assumption (such as how high the clouds are). Atmospheric refraction probably ought to be taken into account as well - it becomes important when looking close to the horizon - I'm sure you've all seen those shots of a strangely-shaped sun just as it sets. When you look through a lot of our atmosphere, as you do when looking towards the horizon, it can do one or two odd things to the light - such as bend it. There's a fairly simple formula you can use if you're ever on an aircraft looking out of the window and wondering how far you can see. I've often wanted to know this while flying over the US mainland, i.e., just how far can I see and what am I looking at way over there in the distance? It probably makes me a very boring passenger if you have the misfortune to sit next to me on a flight! where d is the distance in kilometres and h your height above sea level in metres. Airliners typically cruise at around 11,000 metres (that's around 35,000 feet) which means the horizon is about 380 km away or approximately 235 miles distant. Give or take a few miles for haze and the exact altitude you're flying at, 200 miles is a good assumption on a clear day. The bit I need to work on is how far away those clouds might be given that they are probably 30,000 feet above the ocean. 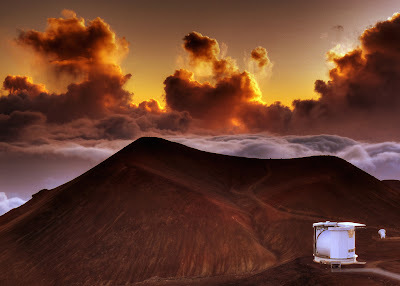 When taking friends and family to the summit of Mauna Kea I often hear the same comment; "it looks like another planet". Just before reaching the paved road that takes you up to the summit the vista is of Mars, volcanic features and red rock. Seeing that view at sunset only makes it look even more Martian. 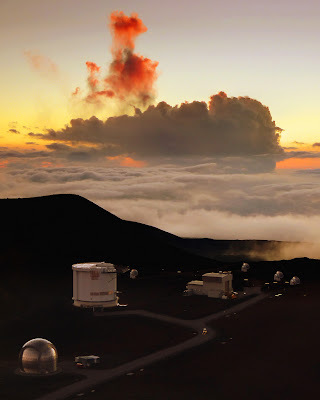 Further up the road, just past Goodrich Pass, visitors get a sudden glimpse of the observatories atop Mauna Kea. There's often a gasp or two! They've just seen what passes for a Martian landscape and now the view really changes - some of the most incredible, out-of-this-world buildings you'll ever see. Keera, author of the wonderful "A Roll in the Universe" made a comment on this blog recently about how this place is set for a science fiction movie. She's right although whether local laws would allow that or not I'm not too sure, but this is a place where NASA trained its astronauts and has tested all sorts of robotic vehicles. It really is like another planet! The observatory in the picture above is the CSO looking very sci-fi! I took one or two very minor liberties to make the picture look a little more Martian! I never enjoyed art lessons at school, I really didn't know or understand what was going on. Today I'm still the same. I can look at a picture and say "nice!" or another that people love and say "huh?!". Being marooned at home due to a virus I got a little bored and tried to take some pictures of normally uninteresting things, such as leaves on a tree. The pictures were as boring as I thought they might be so played around with one or two of them using some software. The picture above was one result. I like it but I have no idea why, and I'm sure that anyone with any background in art will hate it. I don't care though, I like looking at pretty pictures! My usual view of the Kecks tends to make them look quite small, the summit of Mauna Kea is a large area and even massive structures can look very small from elsewhere on the mountain. A couple of weeks ago I took a few photos from some places on the mountain I tend not to visit that regularly and this was one of them - in the parking lot just outside the JCMT. Looking up from Submillimeter Valley certainly helps to emphasize how large the Kecks actually are! I hate it when this happens and it's been rare during my career, but I was supposed to be preparing for an observing run on Mauna Kea this evening and had to call in sick instead. There seems to be some virus going around at the moment that has affected people at work and perhaps one or two others that work at the summit. I'm running out of pictures for my blog and so the blow is a double one! My shift is being covered by someone but I feel so guilty about this - I knew ahead of time that I'd spend a holiday weekend on the mountain so was prepared ahead of time, but now someone has to go up at short notice while I spend the weekend in bed. It's no surprise that some of us summit staff get sick every so often, we spend nights in a small room at 14,000-feet with visitors from all over the world. We live on a small island in the middle of the Pacific which viri have a hard time finding without a modern form of transport, so we're all a little susceptible to those bugs when they do actually get here. 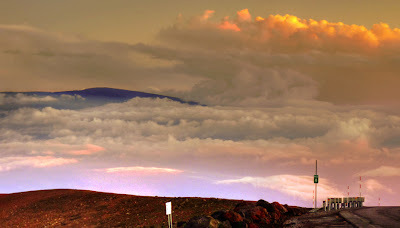 The Kecks (left) are one of the relatively newer observatories on the summit of Mauna Kea while the IRTF (right) is one of the older more established telescopes. No matter, we all do the same thing: wonderful science and admiration of sunsets! Sometimes the sky is at its most colourful well after sunset. This picture was taken a good 15 minutes after the sun had disappeared into the Pacific Ocean. It was a relatively cloudless sunset and those can be quite uninteresting, but way off in the distance the colours looked extraordinary. The CSO (left) and JCMT (right) are in the foreground. Taken from my not so usual spot just outside the CFHT. 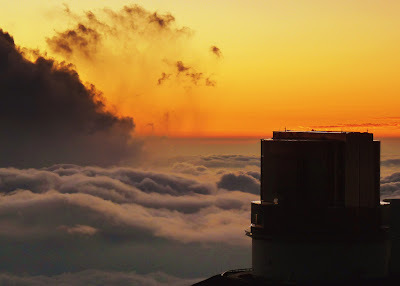 We've all done it, well, I mean those of us that work nights on Mauna Kea's summit. All the systems are run up before sunset and in our case we do some pretty thorough checks to make sure things are working properly, but those tests can indicate something's wrong. If it's a software problem we can do several things in an attempt to find a solution without heading into the dome. Sometimes, though, a piece of hardware fails and we spend the evening wrapped up in winter clothes diagnosing the fault in the cold and exposed dome. Most of the time we try and diagnose faults in the dome by flashlight but sometimes we have to close the dome and turn the lights on because there's a serious problem. On the odd occasion, and I can only remember this happening once while I was at the summit, we forget to close the dome and turn on the lights. This will almost certainly result in a polite but questioning phone call from one of the other observatories asking us why we're lighting up Mauna Kea's sky! I've been on the end of one of those calls, and I've also made the call myself! Working at 14,000 feet has some strange effects on the body and brain and occasionally we do stupid things such as accidentally light up the whole summit! It's embarrassing when we do this but usually someone at another observatory spots it very quickly and we get a gentle reminder about summit etiquette! In this case, it looks as though the staff at Gemini were working in the dome after sunset, there's usually no other reason to leave the lights on with the dome wide open. The lights went out shortly afterwards and before it became dark, so hopefully whatever issue they had was fixed and didn't require a gentle reminder from anyone. What a shame, I'm quite good at gentle reminders! 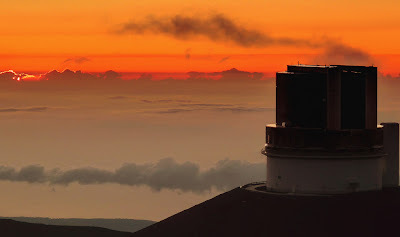 Of the dozen observatories on Mauna Kea, two are dedicated infrared (IR) observatories meaning they only observe at IR wavelengths. 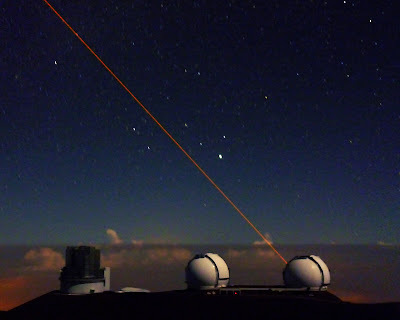 Most of the other optical telescopes are very capable in the infrared and Gemini, for instance, was specifically designed to be optimised for IR observing but it also operates at visible wavelengths. The NASA Infrared Telescope Facility (IRTF - pictured above) and the United Kingdom Infrared Telescope (UKIRT - pictured below) were designed and built solely to operate at IR wavelengths, approximately between 1 and 30 microns (our eyes are most sensitive to optical radiation of about 0.5 to 0.6 microns). 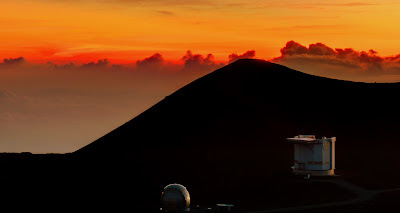 Mauna Kea is one of the best sites in the world for infrared observing, probably only bettered by the Antarctic. 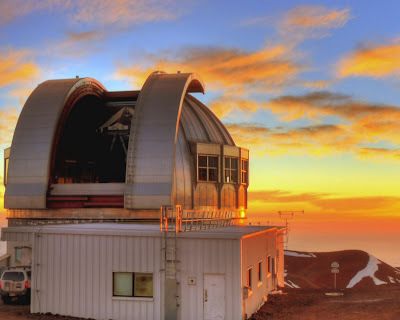 In a couple of my early posts on this blog I explained why Mauna Kea is such a sought-after site by astronomers (here and here) so I won't rehash that here but will try and explain, briefly, why IR telescopes are a little different to their optical counterparts. On the whole, infrared telescopes look the same as optical ones, they have a primary mirror (the big mirror at the bottom of the telescope), a secondary mirror at the top and instrumentation below the primary mirror. There are subtle differences though due to the nature of IR radiation and these are best summarized by the need to reduce the amount of IR light given off by the telescope and surrounding structure. Any mass at room temperature shines very brightly in the infrared so telescopes that observe at these wavelengths tend to have as little structure as they can get away with. Imagine an optical telescope that needs a dark sky and environment to detect the faintest astronomical target, and then imagine it has a bunch of christmas lights all over its structure - that'll really play havoc with observations! You don't need those lights to create the same problem in the infrared, all the metal that forms the telescope, the dome itself, the dome floor and anything in that space glows brightly in the IR. So IR telescopes are built with as little structure as possible. Even the secondary mirrors, which on optical telescopes are large to catch every bit of light possible, are under-sized on IR telescopes. That means that the effective size of the primary mirror is reduced (some light is lost as it passes by the edge of the secondary), but it avoids the instrumentation seeing the glow from the dome floor, the metal holding the primary mirror in place or even the instrumentation itself. The primary mirror itself glows and so is also a source of IR radiation the astronomer doesn't want to see. 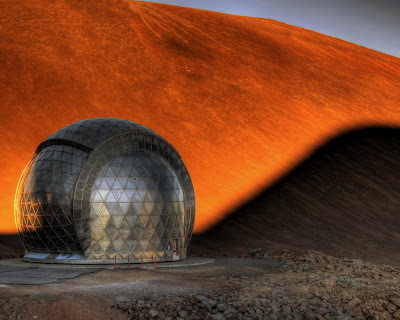 The IRTF overcomes that problem by cooling the whole dome during the day so everything inside should be around the same temperature as the night-time air. UKIRT doesn't cool the dome but instead actively cools the primary mirror so it's kept at typical night-time temperatures and the dome is cooled by opening several vents when the observing team gets to the summit. 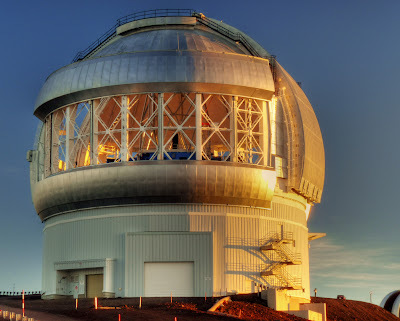 In fact both telescopes make determined efforts to open up as early as possible in the evening to help equalize the dome and outside air temperature which not only reduces the IR glow, but also helps to improve seeing (image quality). 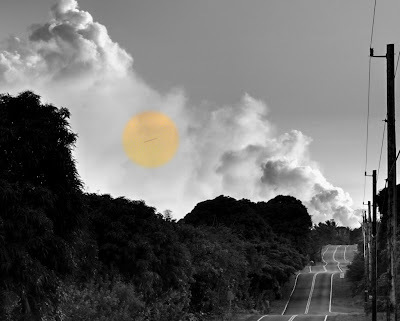 A warm primary and dome will cause air to rise which creates turbulence in the local atmosphere and makes the images much larger and more unstable than they should be. 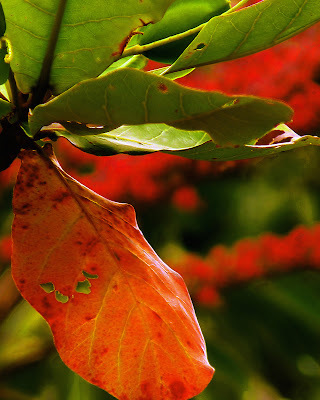 Why observe in the infrared? Light at those wavelengths is less affected by extinction. The galaxy and cosmos is full of dust and it absorbs and scatters radiation (astronomers use the word extinction to measure the amount of light absorbed and scattered). With less extinction, IR telescopes can probe further into regions that have a lot of dust such as molecular clouds and the centre of our own Galaxy and so can see details optical telescopes cannot. Distant galaxies whose optical light is shifted to the infrared via the expansion of the universe are also much easier to detect in the IR. 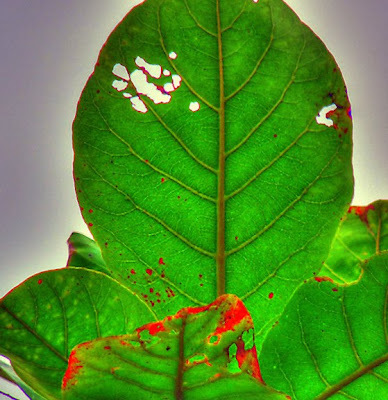 Many molecules either emit or absorb radiation in the infrared and again the only way to detect them or understand the state they are in is by observing them in the infrared. My PhD was spent doing exactly that! I hope this gives you a taste of infrared astronomy. I've obviously left countless details out but just wanted to give a brief overview of what IR telescopes are and what they do. 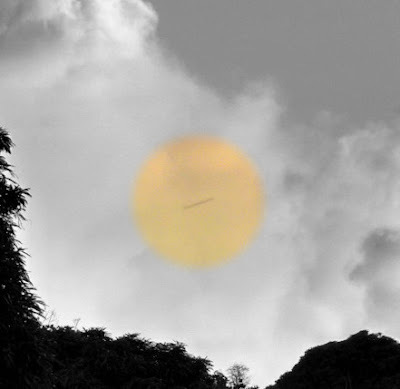 It looked as though someone was using a searchlight on our eastern horizon except the beam was dark rather than light. I've written about anticrepuscular rays previously although when you see them from the mountain they're usually spread across the sky and converge to the antisolar point. Sometimes they look a little different though. We've had a stubborn cloud just off the summit to the west that blocks the view of the setting sun, but it also affects the shadow of the mountain in the east. I think this cloud is also responsible for this ray of darkness in the sky. Meanwhile the earth's shadow, that dark band on the horizon, was as well-defined as I've ever seen. For added strangeness, it snowed at the summit today. It was only a flurry and the snow has melted already, but snow in the middle of August? This has certainly been an unusual year for weather on Mauna Kea. When I first showed this photo to a colleague the other day, one who grew up on the island and is fully aware of all the local legends and myths, the first thing they said was that it looked as though a monster was chasing Tropical Storm Felicia away from the mountain. I looked at him and thought long and hard about how I ought to respond, but I looked at the photo again and I think I can see why he said that (he wasn't being serious by the way!). Not that I believe in huge monsters living off the Kohala coast or anything like that, but it's normal behaviour for someone to use their in-built pattern recognition when looking at what are really quite random patterns and assigning them to more recognizable and familiar features, such as the human body or face. Look again if you can't see it. There's a giant cloud-monster in the middle of the picture with arms wide sweeping up the storm clouds. 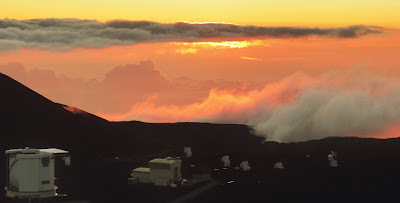 Looking north-east from the Canada France Hawaii Telescope (CFHT) on Mauna Kea one will see a gently sloping plateau that looks as though a collection of cinder cones have been scattered on the surface by some greater power. The contrast between the brown volcanic basalt rock and the red cinder cones can be very dramatic, especially at sunset when the cinder cones are side-lit by the setting sun. Incidentally, in many of my posts you will have seen that I use the words "pu`u" and "mauna", almost always as part of the name of a volcanic feature or mountain. 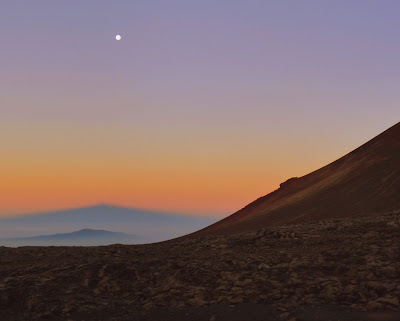 "Pu`u" means "hill" in Hawaiian and "mauna" means "mountain", hence the distinction between Mauna Kea, a mountain, and Pu'u Wekiu, a cinder cone atop Mauna Kea which actually forms the highest spot on the mountain and hence the summit. Mauna Kea is a dormant volcano. It last erupted about 4,500 years ago and will likely erupt again although no one knows when. For the time being it's one of the best, if not the best, astronomical observing site on the planet. 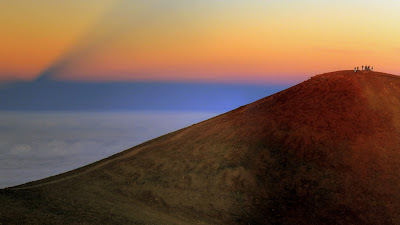 Volcanoes like Mauna Kea typically erupt from fissure vents surrounding the summit rather than the summit itself and these eruptions lead to the formation of cinder cones of which there are a countless number on the mountain. Many have names and I don't know if they all do, I suspect not. The ones in the picture are close to the summit and were likely formed during the most recent eruptions thousands of years ago, but they are now dead. Cinder cones hardly ever grow more than a thousand feet high from their base, they tend to collapse before that point and then the lava flow will burst through the weakest point on the side of the cone which is why many of the cones are horseshoe-shaped. Once the eruption has stopped though, it's extremely rare for an eruption to reoccur at that pu`u but if volcanic activity is high, it's likely an eruption will occur nearby forming a new cinder cone and so on. Hence the cluster of cones in the picture. The reason the cinder cones are so red is that after an eruption has ceased there is still an enormous amount of heat generated by the magma just below the surface. 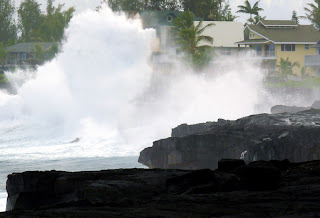 Water trapped within the rock turns to steam and escapes via weak points in the cinder, sometimes for months or even years. This steam oxidizes the iron in the cinder chemically transforming it into iron oxide (i.e., turning it to rust). When the sun sets and the atmosphere turns red, these cinder cones can take on a most dramatic look. The last of Felicia's remnants have gone and we had no problems opening the dome at sunset. It looks as though we're in for a full night's observing in some spectacular conditions. The moon isn't up yet and the sky is very dark. 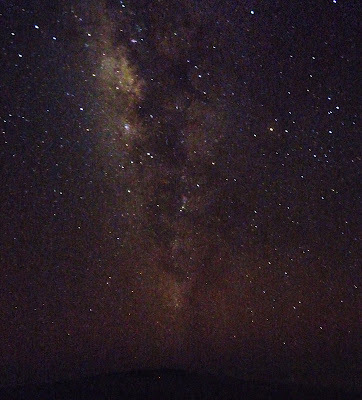 The Milky Way is a spectacular view as I write this, stretched out in the night sky above Mauna Loa. Unfortunately my camera can't do justice to it, but at least I tried! My poor little camera is pretty hopeless when it's dark. I've managed to take some OK images when the moon is up and the night sky is bright (e.g., Gemini laser show) but when there's no moon or it's still low in the sky the images are so noisy and faint it's usually not worth the attempt. Despite that, I had a go last night and the image is OK, but I really had to clean it up and it makes for an odd looking photo. It's a picture of the Kecks "lasing". I spoke to some of the Keck crew on the way up this evening and asked if they were going to be firing off their lasers again tonight, and they said yes, but, while giggling, told me that they don't fire their lasers, they "lase" or "they'll be doing some lasing tonight". Apparently it's bad form to use the word "firing" with "laser" as it scares people. Oh well, I'll try and remember to use "lasing" next time and when someone asks me what I'm talking about, I'll just say it means firing off a laser! 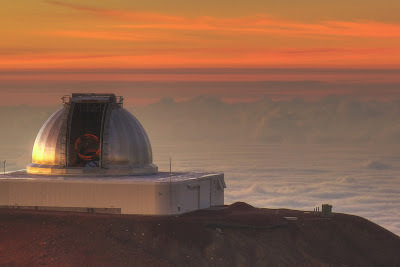 Ever since Tropical Depression Felicia passed through the islands of Hawai`i earlier this week the summit of Mauna Kea has seen some unusual conditions for this time of year. It's rare we get fog and high humidity during the summer (although it happens) and this evening, hopefully, the last of Felicia's remnants will leave the summit. We were even treated to some thunder and lightning this afternoon at Hale Pohaku and arrived at the summit to find clouds surrounding us, but as soon as the sun began to set these clouds started to dissipate and drop below summit level. One particular stubborn cloud remained though, but it allowed for a sunset photograph of Submillimeter Valley and our neighbour, the persevering cloud. With the clouds now gone and conditions rather good for observing, it looks as though this is going to be a long night of data-taking. Does this mean I'm going to have to write about astronomy from now on? Apparently some people think my blog is an alright read. Fools! What confused me though is that they thought this was an astronomy blog. It isn't, or at least it was never my intention for it to be an astronomy blog. I suppose it depends on your definition, but this was supposed to be about what it's like being an astronomer working on Mauna Kea and living in Hawai`i with perhaps the occasional bit of astronomy thrown in. Anyway, some publication called The Daily Reviewer actually thought my blog was one of the "Top Astronomy Blogs". I have to admit I was a little surprised and when I looked at the list it was 1) nice to be thought of in such good company and 2) thought they'd missed out on astronomy blogs much better than mine. Maybe they just like the pictures. 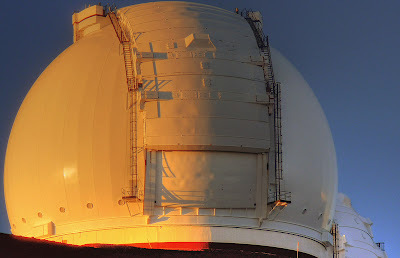 So here's a picture of the Gemini North Telescope on Mauna Kea taken yesterday evening. Just to keep this on an astronomical topic. What a strange and frustrating start to the night. We opened well before sunset as usual but while I was outside our operator closed up again. I went inside and sure enough, the humidity was up at our warning level when we must close the dome (to stop condensation forming on the optics). I went outside again, and five minutes later the dome was opened again. Great! Ten minutes passes by, and this time the dome is partly shut, the dome ventilation system (DVS) is closed but the dome slit remains open. Back inside to see what's going on and the humidity is close to our closing limit but not quite. The DVS was shut in case we had to close quickly, but the dome slit remained open to help cool down the dome. Off I went back outside again to take a few snapshots of the sunset. After the sun had set (not that I could see it, it was behind a huge bank of cloud) we were just about to start observing and up goes the humidity again, so we have to close the dome again. Sigh. Our humidity was a couple of percent below the point where we have to close up, but the CFHT's humidity was much higher which I took as a warning that it wouldn't be long before our humidity would also be too high. 15 minutes later, guess what? Yes, that's right, the humidity was down again so we opened. We had just started to actually observe and drat, who would have thought it? Humidity up again, close the dome and sit in the control room doing nothing other than watching all the weather information we have, and there's an awful lot of that! With no moon in the sky it was too dark to see what was happening outside, but my guess was cloud tops were passing through and being blown over the summit ridge and over us. Although I wasn't actually scheduled to be at the summit tonight, I went up for a couple of hours for some photo taking and we had a bit of a concern about the telescope's image quality, so wanted to have a firsthand look at the start of the night. 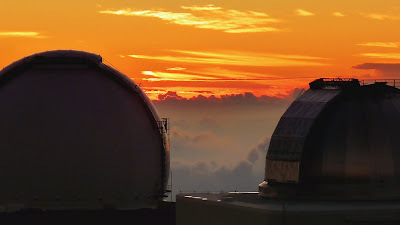 Not being under the usual time pressure at the start of a typical night, I went off to a different place on the summit - next to the Canada France Hawaii Telescope - to watch the sunset. We're still seeing the effects of Felicia at the summit with a very high inversion layer and occasional fog although it wasn't too bad this evening. The high cumulus clouds certainly made the sunset look pretty. 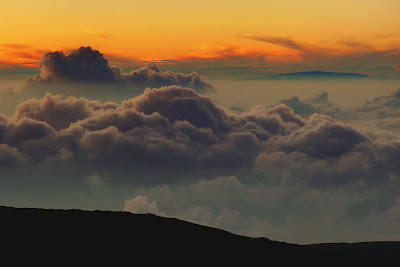 Haleakala, the 10,000-foot dormant volcano on the island of Maui, can be seen in the distance to the upper right. It's back on the mountain tomorrow and despite the summit weather forecast, which has been calling for fog and rain up there due to Tropical Depression Felicia, so far the sky has been clear and conditions excellent. It's incredible to think that just a few days ago Felicia was a category 4 hurricane on the Saffir-Simpson scale (just one below the maximum of 5) with the eye forecast to pass right over my house! OK, so it wasn't forecast to be such a large hurricane by the time it hit the islands, but just three or four days ago the forecast was giving equal probabilities to the storm being a hurricane, a tropical storm or tropical depression, so tensions were a little higher than normal with no one really knowing what to expect. 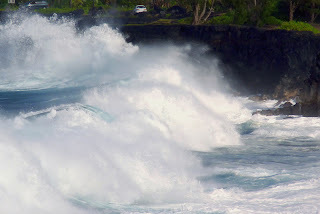 In the end it's going to bring a little more rain than normal to Maui, Oahu and possibly Kauai and we're still to see the effects at Mauna Kea's summit. The surf here was impressive though but even that has gone. Today at work we were all called to the staff lounge at 3pm. Usually this is for a celebration and donuts, perhaps for someone's birthday or a new hire. This time the announcement was different, it usually is a "will you join us in the staff lounge" but this was "please report to the staff lounge" and I knew something was up. When we were all there we were told that a work colleague had passed away. As you might imagine this was a terrible shock to everyone. Staff were allowed to leave early if they wanted and I know I went back to my office and couldn't do a thing, just stare at the computer screen while trying to comprehend what we'd all been told. I'll be off to the summit with a very heavy heart. I took a little time off today between observing runs at the summit and wandered down to the cliffs on Kaloli Point in Hawaiian Paradise Park. 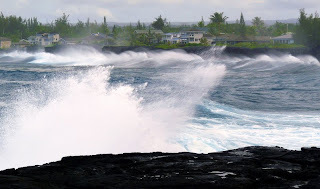 Tropical Storm Felicia is approaching the islands and there was a high surf warning for the windward (east) side of the Big Island and was curious to see how large the surf was. It certainly sounded loud overnight, I could even hear it over all the coqui frogs! The warning had mentioned wave heights of possibly up to eighteen feet but it was obvious that this wasn't the case, at least not yet. It's likely that the surf will rise overnight but even so, the sight was quite impressive, and some wave sets were clearly well over 10 feet and one or two waves I'd estimate at around 15-feet, although it can be difficult to judge without a decent point of reference. Anyway, here are some of the snapshots I took. Looking just south of Kaloli point. This is one of my favourite places on the island for taking photos of the ocean and whale watching, but didn't pop down there today. The houses on the cliffs were certainly taking a battering. It's a lovely place to live with fantastic views, especially at dawn as they face the rising sun, but I'm not sure I could cope with all the maintenance involved living this close to the ocean. Owning a house just a few hundred yards further back from the cliffs is bad enough. Looking north, the sky was much sunnier and the surf was still quite impressive, and seemed to be increasing in height. 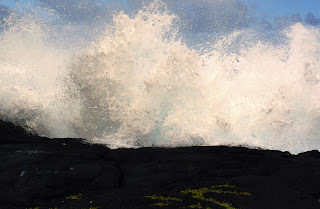 You can probably get some idea of the height of the waves relative to the guy standing on the cliffs, and the cliffs themselves are probably about 12 to 15-feet high on this part of the coastline. Whoah! 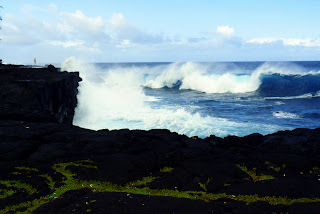 OK, it was time to step back a little, the waves were certainly getting larger. Unfortunately I probably won't have time to get to the cliffs tomorrow when the surf should be at its peak, but I'll try if I can. 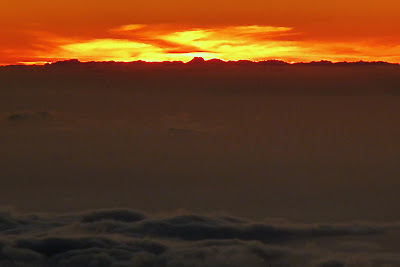 A snapshot taken on the way down from Mauna Kea's summit at sunrise. The Island of Hawai'i appears to be missing part of a mountain as it was seen floating off to the west. 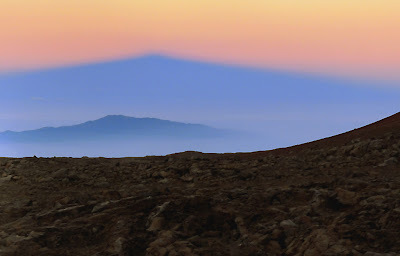 Mauna Kea's shadow confirms that the mystery summit was drifting westwards. Searchers are looking for the rest of the mountain. Not the best picture I've ever taken (in fact it's 3 or 4 photos pasted together to make a panorama) but at dawn at 14,000 feet after working all night (and sans tripod) I have a good excuse! What I liked about this view was the Earth's shadow was so obvious in the sky behind Mauna Loa. I've always had a fascination with natural phenomena, anything from the oceans, mountains, volcanoes and earthquakes to the weather, our atmosphere and the cosmos. If you're ever unlucky enough to sit next to me on an aeroplane I can tell you two things: 1) you'll be in the aisle seat and 2) I'll spend the flight looking out of the window! The Earth's shadow isn't so obvious at sea level but if you're looking out of an airliner's window at sunset or sunrise, or you're on a mountain, you'll have seen that dark band in the sky. It's our planet's shadow. 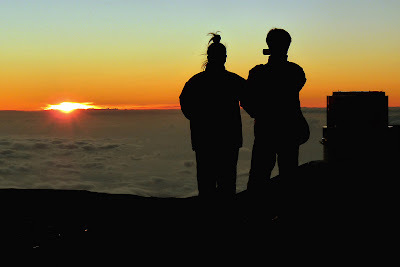 In my last post I moaned, jokingly of course, about a TV film crew hogging my favourite sunset photography spot on Mauna Kea, but didn't know who these people were other than they spoke with British accents and the topic appeared to be about Mars. I speculated that the crew may have been filming for the famous BBC show "The Sky at Night" which I grew up watching and is still going more than 52 years after the first show. The Sky at Night team have been out here on Mauna Kea before so I wouldn't have been surprised to learn they were visiting again, but usually we know about it in advance. Thanks to Chris North's comment on the post though, a researcher for The Sky at Night, I learned this was not a Sky at Night crew but he suggested it might be a BBC crew working with Prof. Brian Cox, a particle physicist and musician who often presents science programmes for the BBC. After a little research and finding Brian's twitter page, I'm 99% certain this was Brian working on a BBC documentary called "Seven Wonders of the Solar System". I am very grateful to Chris for his tip as it led me in the right direction! From Brian's tweets (twits?) I learned that he was filming a segment on Olympus Mons, a massive volcano on Mars. For those not familiar with the subject, Olympus Mons is the largest known volcano in our Solar System. It dwarfs Mauna Loa which I briefly described in "Sunset views of Mauna Loa", its height above Mars' surface is an incredible 16 miles or three times the height of Everest and is nearly 400 miles wide. Considering Mars is a much smaller planet than the Earth the size of Olympus Mons is simply staggering. The reason Brian was visiting Mauna Kea (and both Kilauea and Mauna Loa) was, I suspect, because Olympus Mons is a shield volcano and therefore the same type as the Hawaiian volcanoes. Coincidentally, Olympus Mons played a small part in my career a few years ago. 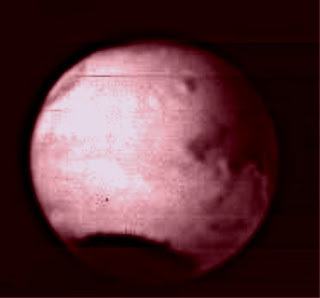 I was commissioning a new mid-infrared instrument called Michelle and the team and I thought it might be a nice idea to see if we could image Olympus Mons although we were rather pessimistic about the chances of success. Mid-infrared observing from the ground is really difficult, even on Mauna Kea, but we thought it would be a bit of fun and a break from the more rigorous commissioning schedule. In addition, we were still working with an engineering array rather than a decent scientific-grade array, so we really didn't expect to see much more than the disk of Mars and even then it would be horribly distorted. It turned out we were wrong. 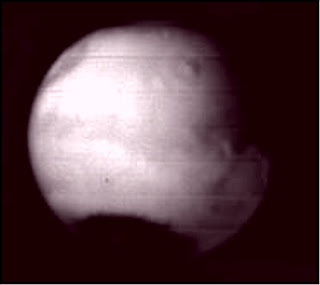 Mars at 7.9-microns. 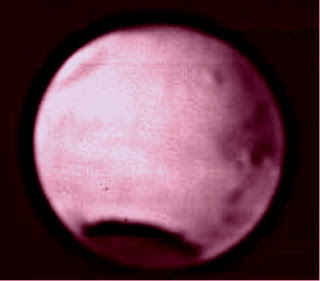 The dark patch at the bottom is the south pole, the blob just to the right of centre and near the top is Olympus Mons. 7.9-microns is a tough spot to observe through our atmosphere, so we were quite surprised to get this image! The stripes are due to the readout of the poor-quality engineering-grade mid-infrared array. At 11.6-microns the volcano really stood out. I was astonished when I saw this image for the first time. It might not look good to most people, but we really didn't expect to see any features at all yet this thing clearly exhibited a shadow and must be a large mountain. (Three quarters of the way up, just right of centre). This might look like a terrible image, but it's was taken at 20-microns which is just about the toughest wavelength to observe from the ground, you really need to use some special techniques and have really clear and dry conditions. To say I was somewhat pleased when I saw this pop up on our displays would be a bit of an understatement! This evening I popped outside for the sunset as usual and found a TV crew had stolen my favourite sunset watching/photography spot. Just who do they think they are I ask you! How thoughtless! Seriously, I have no idea who they were although the accents were British, so could possibly have been the BBC out filming a science documentary or similar - The Sky at Night? The person talking to the camera didn't look like Chris Lintott, one of the presenters of that show, but I might be wrong. From what little I overhead I think they were filming something about Mars. In any case, I'm going to have to make myself a little sign and stick it in the ground there - Tom's Photo Spot, Stay Away! We left the telescope just as the sun was rising above the inversion layer thousands of feet below us. On the drive down the shadow of Mauna Kea was very obvious in the west, but just as we reached the turn off for Submillimeter Valley, the view was so nice we had to stop and take a few photos of Hualalai and the shadow. I don't have too many sunrise shots from the mountain, I'm usually so tired the last thing I want to do is stand outside with a camera when there's a hot breakfast and bed waiting a few thousand feet below, but it was worth pulling over! Gemini put on one of their laser shows tonight, just the thing to get me out in the cold night air at 4am to freshen up a little. It's been a strange night, some excellent data and then some real rubbish when the atmosphere suddenly became very turbulent, but then improved. It allowed me to send some long sequences to our observing queue and take a short break outside with the camera. Update 8th Aug 2009: I replaced the image with a new one, think I over-processed the original at 4am in the morning at 14K feet! The laser is a little more obvious now. There were a gazillion sightseers up here this evening to watch the sunset although fortunately there weren't too many in my favourite spot for photographing the twilight sky. I keep hearing things about the number of visitors to Mauna Kea dropping off but whenever I'm here the numbers just seem to be growing. 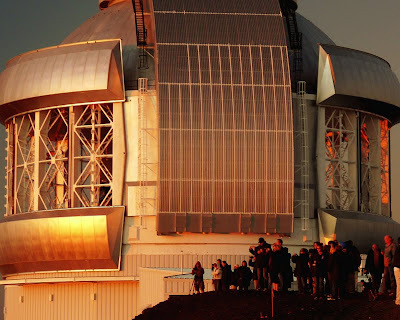 This evening's sunset was rather uninteresting without any high clouds to light up the sky, however, behind most of the tourists' backs to the east was an amazing sight - the full moon rising in the shadow of Mauna Kea. The three hikers coming down from the summit probably didn't realise that a few of us had spotted the the shadow and moon and that they would appear on a few photos! To be honest, the view wasn't a surprise. 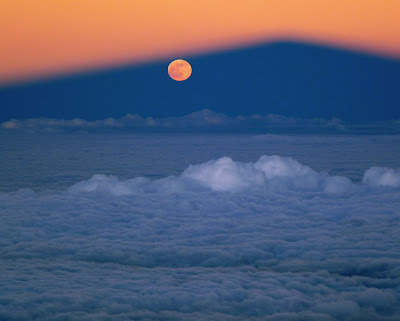 We've recently had a lunar eclipse so the moon is still aligned closely with the sun and therefore a full moon should rise close to the antisolar point (the point in the sky opposite the sun), and that's exactly where Mauna Kea's shadow appears. The only thing I wasn't sure about was whether the moon would be close enough to the node to be in the shadow, and fortunately it was! On the bad side, however, I broke my tripod. Rats.